Yash Raj Films might not know this themselves, but they've probably found the best way to shoot a period movie in a super cheap manner. Wondering how? Well, just set the movie in Calcutta, the city whose landmarks have been the Howrah Bridge, Victoria Memorial and Kalighat temple for times immemorial. No sets required, no detailing required - just dress up your leads in some retro clothes, and use the aforementioned landmarks. Lo and behold, not one single person can tell you what time the movie is set in! We also discovered one other thing Yash Raj Films might not know. And this is the fact that they have now become so addicted to slow motion, that the leads, negative characters, side characters, extras and every other conceivable element on screen moves in slow motion now. So much so that the length of Gunday without all the slo-mo shots could hardly be over 30 minutes - allowing for four 5-minute songs - meaning the movie in all would not last longer than 10 minutes. Gunday, therefore has a bare-bones script woven around a few mildly interesting characters - two golden-hearted goons who are best friends, the police officer who comes to arrest them, the girl who both fall in love with and who ultimately ends up dividing them, and a villain from their past. The plot is as predictable as the characters, and you can see every twist coming from a few light years away. What saves Gunday then is the complete abandon with which the actors approach the movie. Ranveer Singh turns in a showy performance, much more showy than the one he put on in Ram Leela. Arjun Kapoor is impish, and has a goofy grin that goes a long way in projecting his character. The rippling six-packs which our heroes display unabashedly also show how they stand for gender-equality. Why is it that the heroines have to do all the showing? The heroes of Gunday clearly believe that they should do it in equal if not greater measure. Priyanka Chopra sticks out like a sore thumb in the movie. She dresses up impeccably in the middle of all the chaos, and overacts. Maybe we've seen her too many times, but it certainly seems like we've seen her do the same shtick a few million times. She only has one awesome slo-mo moment, a piece of awesome choreography in the Tune Maari Entriya song that had the audience hooting. Irfan Khan puts in an impeccable performance as usual. The others are all fine. The music, but for the song mentioned above and Priyanka's cabaret number, is ho-hum. The film is shot very well, and the technical values are excellent - it would not do for a Yash Raj film to not have them anyway. Gunday is a throwback to the '80s - where all the characters speak in punchlines, the songs are all staged with major set pieces or on picturesque locations, and the goons are mostly golden-hearted. The climax stretch is a slight disappointment due to its refusal to end. But it is a decent one-time watch just for the masala flourishes it manages to add. Be the first to comment on Gunday! Just use the simple form below. fullhyd.com has 700,000+ monthly visits. 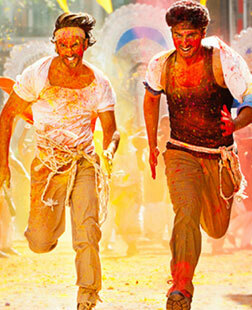 Tell Hyderabad what you feel about Gunday!